, lightweight, compact 3 led torch, will run for up to 3 hours on 3 xAAA alkaline batteries. Supplied with three standard batteries, complete with 360 degree swivel clamp. See the light over one mile away!!! 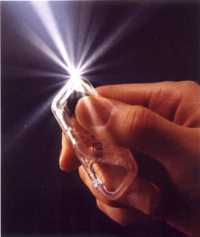 Mirage - new wearable light from ASP - the people who produce the famous Sapphire torch. Lifetime Battery Replacement (send it back to the manufacturer in the USA with 4.50 for postage).